54W – 1150mm/46” (l) 5/8”- 16mm (d). Using an iQuatics Reflector alongside your fluorescent tubes can increase the output by up to 100%, thus making your fluorescents more efficient. 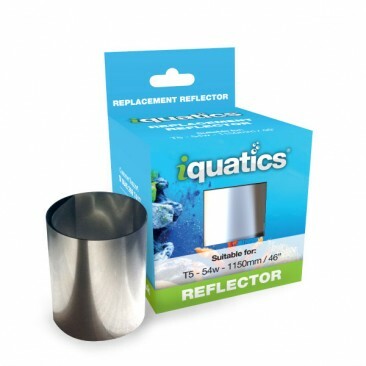 The replacement iQuatics reflective sheet is manufactured using a non fibre polyester material with a silver gloss surface. Nice product. Great that you can change the reflective strip, with out having to replace the whole refector. In the saltwater tank hobby, reflectors never last that long due to salt water corrosion. It is nice just to be able to replace the reflective strip, and not to have to replace the whole reflector. Great product. Brilliant and simple to use. Fantastic quality and fantastic company.